A well structured and drafted LLP agreement is very much required for the successful functioning of an LLP. Since an LLP is not a company and provisions of the company law is not applicable to an LLP, the LLP agreement must address all corporate structure related issues in the LLP agreement. The name of the LLP shall end with LLP or Limited Liability Partnership as per the provisions of the LLP Act. Since the LLP agreement is executed after incorporation and as per incorporation, the same needs to be executed within 30 days of incorporation, the date of the LLP agreement must be a date within 30 days from the date of incorporation. As per the LLP Act, an LLP agreement is an agreement between partners of LLP or LLP and partners; hence, the parties of the LLP agreement can be all partners or LLP and all partners. For our agreement, the parties are the LLP and its partners. This section describes incorporation details, state of registration, activities of LLP, etc. 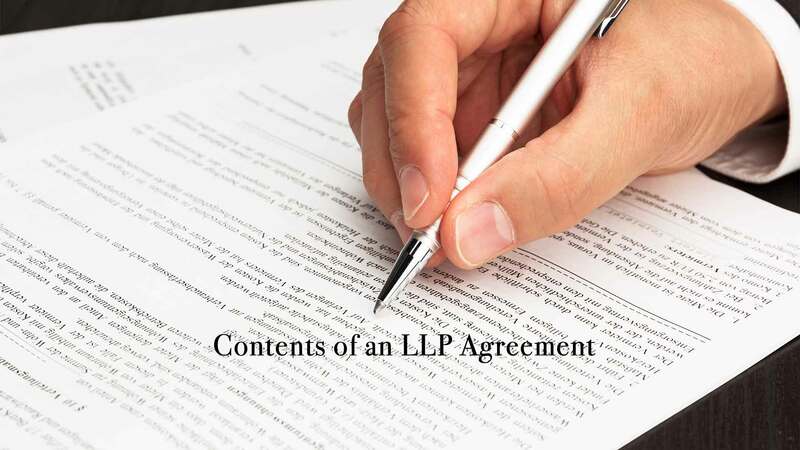 Definition of terms used in the LLP agreement, name of the LLP and future name changes, initial partners, new partners admission, business activities, power of LLP, duration, management, accounting, auditing, etc. How each partners contribute, whether they can take back the contributed amount, interest on contribution, etc. How partners’ rights can be redeemed from the LLP, method of readmission, cross purchase, etc. Fresh issue of rights in the LLP including admission of new partner. Procedures for sale of partner rights, transfer of rights, etc. to existing and new partners. Rights of each partner to inspect records of LLP and copies of the same. Method of appointing arbitrator, proceedings, etc.